PDP crisis: No victor, no vanquished, says Ekweremadu – Royal Times of Nigeria. The Deputy President of the Senate, Senator Ike Ekweremadu, said that the Supreme Court judgment on the Peoples Democratic Party, leadership crisis, has ushered in a new dawn of peace, reconciliation, and recovery for the party. 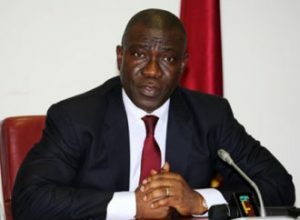 Ekweremadu reacting to the apex court’s verdict on Wednesday said it was a no victor and no vanquished situation for individual party members, but rather a collective victory for the entire party faithful and the nation’s democracy. He said: “I am happy that the Supreme Court has brought this protracted leadership tussle to an end today. There is no victor and there is no vanquished, but a collective victory for our party and the nation’s democracy. No democracy can prosper in the absence of a virile opposition or under the extreme hardship Nigerians have faced over the past two years. Citizens deserve a viable alternative. “The ruling party has indeed profited from the prolonged power contest, not just in terms of defections, but also in the unchallenged degeneration of democratic values, rule of law, electoral practice, and the economy because the PDP has been too distracted to keep them on their toes. “But, it is heartwarming that calm is returning after the storm. I salute millions of our party faithful and Nigerians who stood firm to weather the storm for their courage and loyalty, and sincerely appeal to those who left for one reason or the other to return to our big political family.